Do empaths have a stronger connection to the animal kingdom? Answer: I love animals. They are powerful conduits of unconditional love. I view our sweet animal companions as teachers and healers. Though all people with loving hearts can feel their goodness, empaths are especially sensitive to absorbing the pure unconditional love that cats and dogs and other animal companions so generously bestow. It is very soothing for empaths to be around that love. Wild creatures exude power and grandeur, a bit of a different energy, that can be very vitalizing too. Empaths often find people difficult and harsh whereas loving animal companions nurture them. 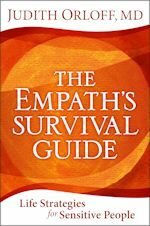 I feel so strongly about this subject I devoted a chapter in my book, The Empath’s Survival Guide to it. As a physician I know that love can create miracles that defy logical explanation. Selfless giving resonates with such mystery. How wondrous and far reaching compassion can be among all living beings. Each of us is capable of limitless love. The monumental implications of this fact continue to reveal themselves over the years, always giving me chills and re-clarifying my emotional priorities. I hope you know that love exists between all sentient beings.